Explore world cultures through wine, beer, and appetizers. Join us at La Navona for evenings of worldly experiences. Travel to Italy, Spain, and America’s own southern roots without having to leave Gahanna. Local breweries are a huge reason why Columbus is such a fun city to live in. 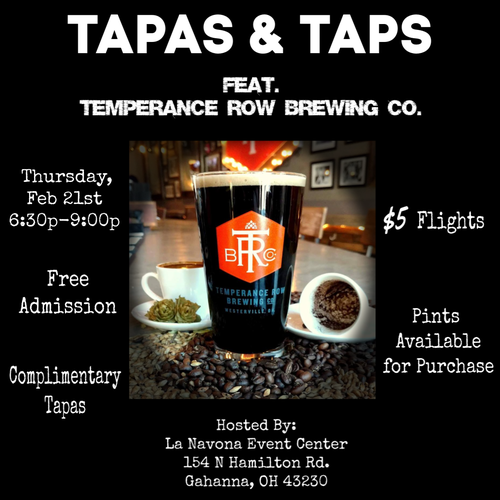 To close out our series, we want to highlight one of our favorite breweries in town, Temperance Row Brewing Company. Come sample different craft brews paired with mouthwatering tapas to get you through the final weeks of winter. Drink ticket for a full pin of your favorite included.